MD - Pathology and Microbiology, M.B.B.S. Dr. Vineeta Sood, M.B.B.S, M.D (Pathology), having illustrious experience of more than 15 years, is the head of department of Lab Medicine & Senior Consultant at Alchemist Hospital, Panchkula. 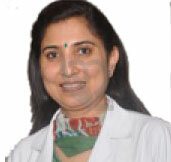 Dr. Vineeta Sood an alumna of the prestigious institute Dayanand Medical College, Ludhiana from where she attained M.D. (Pathology) in 1998. She has worked as teaching faculty in various medical institutes. To her credits, she is a Certified Technical Assessor for NABL and has a keen interest in Laboratory Quality management system.